Is even B.R. 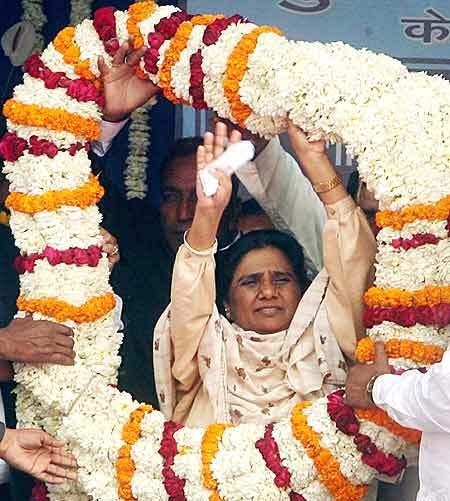 Ambedkar safe in Mayawati’s hands? This was the view of the renowned author Barbara Ward Jackson in her contribution to the commemorative volume Mahatma Gandhi 100 Years edited by Sarvepalli Radhakrishnan and published in 1968. Untouchability was widely prevalent in pre-independence India and the privileged sections of society shamefully practiced it, unleashing a sort of violence on the less privileged. Gandhi responded by labelling the less privileged as Harijans (God’s men). The privileged were made to shoulder the responsibility of serving the less privileged and thus undoing the wrong done by their predecessors, generations after generations. Gandhi founded Harijan Sevak Sangh during his life time and he was its founding President. Gandhi had a higher goal and objective in doing all this and had he survived his assassin’s bullets, would have perhaps strived even harder to create an integrated nation by breaking the social alienation between Harijans and the rest of the population. All this, of course, is known. However, Uttar Pradesh chief minister Mayawati‘s scathing attack on the Mahatma is surprising, if not ill motivated. While addressing a meeting of MPs and legislators of her Bahujan Samaj Party (BSP), she is said to have called the Father of the Nation a ‘natakbaaz‘ (fake). Has Mayawati studied the works of Gandhi in depth and submitted a thesis to draw this uncalled for and controversial comment which has taken even Dalits by surprise? If today she can call Gandhi a ‘fake’ , who will she use the same terminology on tomorrow? Admittedly, this is a free country and Mayawati is free to use her right of expression. Maybe, the Mahatma himself wouldn’t have minded such searing scrutiny rather than blind worship. But is this scrutiny or slander? Is this justified criticism or motivated mischief-mongering? Or is this just plain megalomania; an ant firing at one of the greatest souls to have walked this soil? This entry was posted in Issues and Ideas and tagged B.R. Ambedkar, Babasaheb Ambedkar, Bahujan Samaj Party, Barbara Ward Jackson, BSP, Churumuri, Harijan, Harijan Sevak Sangh, Mayawati, Sans Serif, Sarvepalli Radhakrishnan. Bookmark the permalink. Why dose this ***** gets the media attention, I guess if the main stream media just boycotted her it would be good. The so called champion of Dalit seems to be doing the biggest natakbazi….Kanshiram…where did u find her ?!!!! mayawati has proved to be a corrupt, slandering and mean megalomaniac — I doubt she will ever be accepted by a majority of India’s voters. So are we implying that if Mayawati hadn’t spoken anything about the Father of the Nation, she could have been considered as a saintly, messianic leader? You need to let the barking dogs bark. Mayawati is definitely one of the worst of it’s ilk — sorry my canine friends. She is a mean, corrupt, idiotic dimwit who is looting at will. Her slander in the name of getting Dalits’ their due is nothing more than another drama. She is a shameless skunk. Just shut up lady. In a related topic — related by humanity and it’s struggle for basic freedoms–, kudos to the Iranians who are fighting a fierce struggle against despots that have hijacked their mandate. See this posting in HuffPo ; support if you can ; spread the word ..
1:32 PM ET — Killers. This is very graphic video so please be cautioned. A desperate group of people try to save a demonstrator who’s been stabbed, to no avail. That’s what she deserves. I mean how low can our politicians stoop. Mahatma Gandhi was the guy who got India independence, period. He should not be spoken with disrespect inside borders of India. And coming to issue of dalits, how much has the so-called Behenji done for her community. Given a chance she keeps shouting that dalits are misrepresented in India, how much has she done. Why doesn’t she go and do something useful for her community rather than shouting bad things about the one person who actually did something for people from her community. Churmuri pleasee, as it is there is institutional bias against “Backward class” leaders, be it Mulayam, laloo, paswan, Gowda, Karananidhi etc. What we really need is more leaders from “Majority community” of India, not the same born again , born to lead doing “PHOTO SHOOT ” leaders. Atlast someone found courage to question the accepted “wisdom”. What Gandhi did is perpetuate the suffering of the dalits by excluding them again in new India by the tag of Harijan. He never tried to braek the caste system, but reinforced it. After all the India’s resources needs to be “bander baat” between gandhi’s and Pandit Nehru’s communities. So 45% of India became Backward class, 27% Harijans untouchables, 12% baber ki aulad for yearly riots festivals. Lo all India is available for select few. By abusing Gandhi, Mayavathi is very much following the mentor of all Dalit politicians, Ambedkar. Ambedkar was the fiercest critique of Gandhi. Gandhi’s main philosophy and actions were centered around building consensus. Consensus between different warring communities or rather nations which created India. Many Muslims opted out of this consensus and created the Muslim nation of East and West Pakistan. Ambedkar for example was never reconciled towards a nation called India till early 1940s. But finally Ambedkar did come to terms and upon the recommendation of Gandhi became the architect of our constituion and India’s first law minister. Ambedkar could never become a Jinnah because the identity of Dalits or the oppressed class was a new construct and he did not have any mass base to mobilize the thousands of warring geographically dispersed communities and tribes within the Dalit fold. Even the much hyped position of Ambedkar in the Poona pact where Ambedkar was supposedly cheated by Gandhi was anti democratic. Separate electorates is certainly not the way to go if you want to build a nation. Gandhi was against division and was not cheating the Dalits (harijans as he called them) as he is alleged by many. Gandhi simply put did not fall prey to the British divide and rule policy. Ambedkar did not have a good case even in the roundtable conference. It is not very difficult to prove that Ambedkar, Savarkar and Jinnah represented divisive forces pepped up by the British divide and rule policy. The congress for all its flaws, hypocrisy and corruption has been the glue and balancing force in Indian polity. The moment congress mindset weakens in India, divisive political forces whether they be caste or religion or class based become more prominent. This election was a watershed for these three sections. By themselves none of these can come to power and their only hope is through a fragmented polity. If Mayavathi gets into sarvajan mode BSP would be no different from congress same would be BJP without Hindutva. Gandhi had more mass support than Ambedkar could have ever imagined. It can even be argued that Ambedkar has only aliented the Dalits even more in Indian society by his hardheadedness and non acceptance of anything good in his perceived enemies. Many poor communities who have not been caught in the Dalit identity discourse where able to move upwardly in India without much political support. Mayavathi sadly is down but not out. She and her ideology will always be a marginal player in Indian polity. Thanks Metaemp. Yours was the most rational argument I ve read in this matter. Come on, lets call a spade a spadel! You are attacking Mayawati not because she said something about Mahatma Gandhi, but because she criticized the next great hope of India: Rahul Gandhi. Oh dear, the games you guys play! Two months ago Mayawati was the next big thing and now it’s Rahul Gandhi- at least for some people- really the games people play while 600 million people go hungry every night. with all due respect to M K Gandhi(ji), i disagree that he was THE GUY who got us freedom. if this were true, then one would not study the Indian freedom struggle from the times of the sepoy mutiny and mangal pandey et. al. till 15.08.1947. He was ONE among many of the key figures in securing our freedom …this i stick to irrespective of him being legally referred to as father of the nation. Personally i dislike his methods and if he truly was the “father” of the current partitioned and torn up india, i wud much rather have had hime shot a lot earlier than the actual partitioning and the freedom movement. But WTH, no good came out of criticising those dead and gone. What is imp is how one deals with the current probs n how we think it will profit the future. One has to understand that the present state is a result of the past, be it of one man likee Gandhi or many like all our freedom fighters and politicians put together! Pretty soon she will discover how Ambedkar adopted the Brahmin sounding name after a Brahmin teacher told him to, and that will be the end of it. As it is, she thinks she is the equal of him. Gandhi was the evil person who had snatched the seprate electorate rights from dalits by going fast for 24 days.Because of Gandhi ,dalits are suffering in India and even they are not able to send their true representive to Parliaments.Reseved seats are being won by hindu bummlicker dalits who are taking side of hindus.time has come dalits should demand for seprate county away from barbaric hindus and son of gandhi. yes ,kumarpushp said well.i am agree with him.he said the real and valuable truth .good. Is there any reason why one should not talk anything other than good about the father of our nation? Are we conditioned in a very cunning manner only to praise the Mahatma? Why are we dismissing the hidden stories of these people? There are a ton of books with perfect evidence that the Mahatma we think is not the same Mahatma. These books were suppressed, very cunningly. There is proof that the Mahatma recited the hymns from the Gita, Quran, Bible. and when he recited the bible or the quran, he would read only those lines that were synonymous with the Gita, and hence called Gita his mother. Isnt the casteist mind at play here? Similarly have we tried to read or atleast search for the other side of the mayawati story? what we see is what we believe. we see the media we believe them. What is wrong if the statues are erected? The money invested in raising them will be taken back through tourism. It is a state property. Someone had to break the ice, as far as the welfare of the suppressed is concerned, mayawati is doing it. And what kind of question is this? “is Even B.R Ambedkar safe in mayawati’s hands?” like he was very safe in the hands of the congress. Every step of the way he has been criticised. None have tried to understand him, even if they did, they have pushed him to a corner. If B.R Ambedkar is safe, it is only in Mayawati’s hands. Kindly stop this. Lets get into the psychology of the matter, we can see the fact. that was hidden, all those heroes who had a glorious past will be exposed.